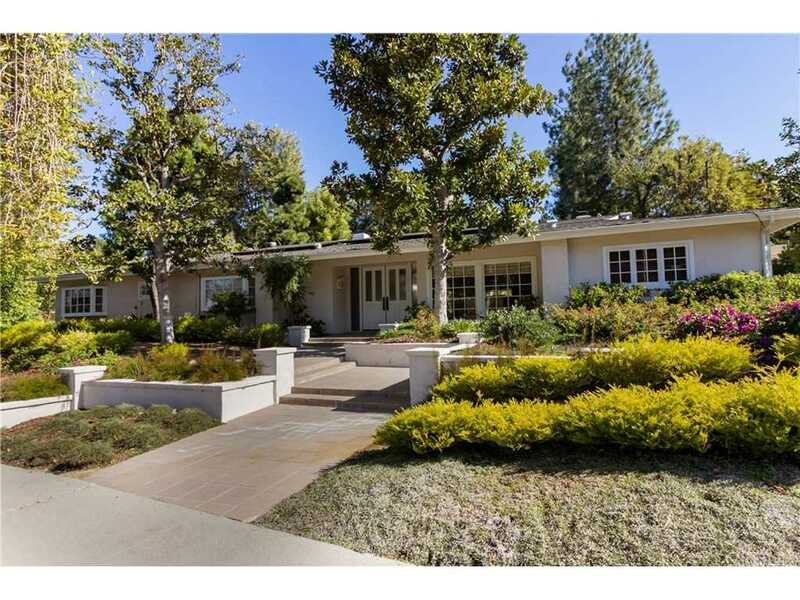 Welcome to this sweeping bright single story corner home in the beautiful hills of Encino. The professionally styled drought resistant landscape invites you to a home of comfort and style. All will appreciate the walls of glass in the living family room, custom fireplaces and high white beam ceilings making this flow perfect for entertaining. French doors lead to the yard with pool and generous patio to enjoy the privacy. The light and white kitchen, walk in pantry, and long granite counters are designed for the practical chef. Wood floors invite you to the master area which has a custom closet design with well thought out organizers, French doors to a private courtyard and a recently remodeled owner's bath with spa tub, wrap around dual sinks and vanity, walk in shower and water closet. Two additional generous bedrooms share a remodeled bath between them. An addition bedroom is located on the other side of the home off the kitchen area with another remodeled bath that also can be used as a pool bath. Solar energy efficient system and resurfaced pool are just a few of the upgrades that enhance this home. You will be impressed and look forward to coming home to relax in this well styled home. Lot Size: 0.38 Acres / 16461 Sq. Ft.
SchoolsClick map icons below to view information for schools near 18077 Lake Encino Drive Encino, CA 91316. Listing provided courtesy of Cindee Zabner, Keller Williams Realty World Class. Home for sale at 18077 Lake Encino Drive Encino, CA 91316. Description: The home at 18077 Lake Encino Drive Encino, CA 91316 with the MLS Number SR19028201 is currently listed at $1,518,000 and has been on the Encino market for 70 days. You are viewing the MLS property details of the home for sale at 18077 Lake Encino Drive Encino, CA 91316, which includes 4 bedrooms, 4 bathrooms and has approximately 3360 sq.ft. of living area.